Teeth structure is exceptionally strong, and you can enjoy the form and function of your teeth for the better part of your lifetime if you take care of your overall dental health. Taking proper care of your dental health involves good oral care habits, as well as going to the dentist for regular check-ups to ensure that dental problems may be prevented – or treated in the earliest possible time. However, there are times when even the best dental health care may not be enough to ensure that your teeth are protected. Trauma to the teeth and the facial areas can come from accidents, injuries, or even from unconscious teeth grinding. If you feel that you need additional protection from your teeth from these events or circumstances, a mouth guard may be your best option. 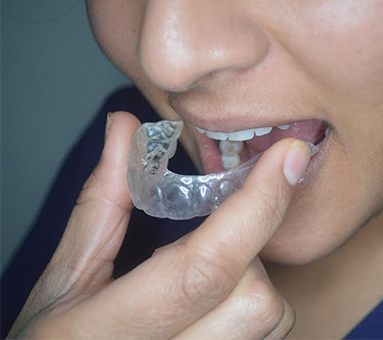 Mouth guards are dental devices or appliances that protect your teeth, and the whole oral cavity, from serious trauma due to accidents, injuries, or even from teeth grinding. A mouth guard can also protect the lips and other soft oral tissues from suffering from serious injuries, especially when engaging in contact sports such as basketball, boxing, or football. Mouth guards are usually provided to provide protection for the upper teeth; however, there are cases when mouth guards can be created to fit over (and protect) the lower teeth parts as well. Boil and Bite Mouth Guards – Also called mouth adapted mouth guards, boil and bite mouth guards are created from thermoplastic material. A boil and bite mouth guard will need to be softened by placing it in hot water prior to placing it in the mouth so that is can be shaped around the teeth. Stock Mouth Guards – Stock mouth guards are considered as ready to wear mouth guards, and can readily be bought at sporting goods stores. However, as stock mouth guards are not created to fit exactly into your mouth, they can do more harm than good – a bulky stock mouth guard may actually add to an injury if trauma is experienced in the mouth area, since the fit is not as comfortable as custom made mouth guards. For this reason, dentists very rarely recommend the use of stock mouth guards, since they can do very little in protecting your teeth and mouth against injuries – and may even aggravate the situation. Are you in search of a highly experienced, trustworthy family dentist in Islington and the surrounding areas of London?